Here are some levels to monitor for the near term on AAPL, SP500, and the Nasdaq 100. Watch the video for details. Will The Oversold Bounce Continue? There could be a continuation on the oversold bounce that started last week for the market. Here is a video that take a closer look at some of the support and resistance levels for the SP500, DJIA, Nasdaq 100 and the Russell 2000. AAPL is trying to reverse its recent downtrend. Until it can reclaim the 618 level, the trend remains down. The nearest possible support is 517. If it breaks below this support, look for potential capitulation near the 425-427 region. Keep an eye on IBM's price action if you are wondering where the DJI will go. Watch the video for more details. The US dollar continues to strengthen due to 'flight to safety' caused by the uncertainties from the Euro crisis and the direction of the US economy. All the major sectors appear to have turned downward. Until the current uncertainties are removed from the market, the market will continue to be very news driven. Unless one is shorting this market, it is best to move to the sideline and wait for the dust to settle before start looking for long positions. Presently, it is best to be 'out of the market wishing you are in' than 'in the market wishing you are out'. Capital preservation is job one right now. Do not be tempted by a dead cat bounce that will likely to happen in the near term as the market is getting to the oversold condition. Wait for confirmation from the market that the end of the downtrend has occurred before moving back into the market. Here are the updates for AAPL, GLD, MCP & HD. Video posted. Here are three stocks that have benefited from the recession; HD, AZO and ORLY. Their run up might be coming to an end. Their price actions are showing possible break toward the down side. Video posted. Just a follow up on a reminder. Tomorrow before the market open, HD is scheduled to report its quarterly earnings and the options market is pricing it to move +-10% (+-$5). MCP might have formed a triple bottom price pattern and it could be setting up to make another attempt to fill the 36/38 gap. Check out the video for more details. Looking at the gold ETF, GLD, it is approaching the 152 support level. If it bounce off this level, then a possible swing long to the upper level of the trading range near 175. If it fails to hold 152, then look for lower prices in the 140 region. Here is a market recap video for the week just ended and a look at what to watch for the coming week. Beware next week is another OPEX week, expect increase volatitily. Support level for AAPL to hold is 558. If it can't hold 558, then next possible support level is 548. The SP500 support level is 1340. If it can't hold 1340, look for next level of support near the 1325. Gold has lost its glitter today by broken below the long term supporting trendline, and AAPL was taken down to the 558 level then bounces back near some of the recent support/resistance levels. Here are the videos that highlight the price action for GLD and AAPL, and what potential price levels to watch for the near term. Look like those $700+ price targets for AAPL will have to wait. The market appears to be heading down to lower level and so is AAPL. One way to trade the downward move without shorting the market is to use the inverse ETF for the SP500 & Nasdaq 100; SH & PSQ respectively. Here is a look at what has transpired for the week ended 5/4/2012 and what to watch for the coming week. Reminder to the email subscribers, click on the title of the post to view the video. Ever since the blowout earnings report, AAPL has been on a downward slide. If it can't hold above 578, look for it to go down to fill the earnings gap near 562. A video previewing what the market might do when the April job numbers come out tomorrow. Here is an update on my GLD trade. This trade was stopped out yesterday. Today, the DJIA closed at a multi-year high. 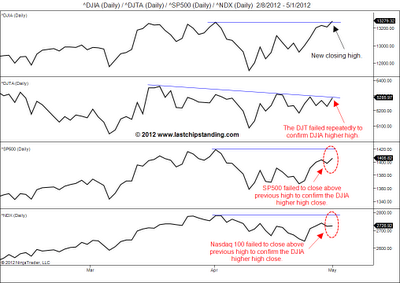 But more importantly, neither the SP500, Nasdaq 100 or the Russell 2000 closed at a new high along with the DJIA. This non-confirmation reinforce the Dow Theory non-confirmation between the DJT and the DJIA. If today's closing high does not turn out to be the top for this uptrend, then this will at least serve as a signal to the market participants that the internal market has topped out and longs beware. 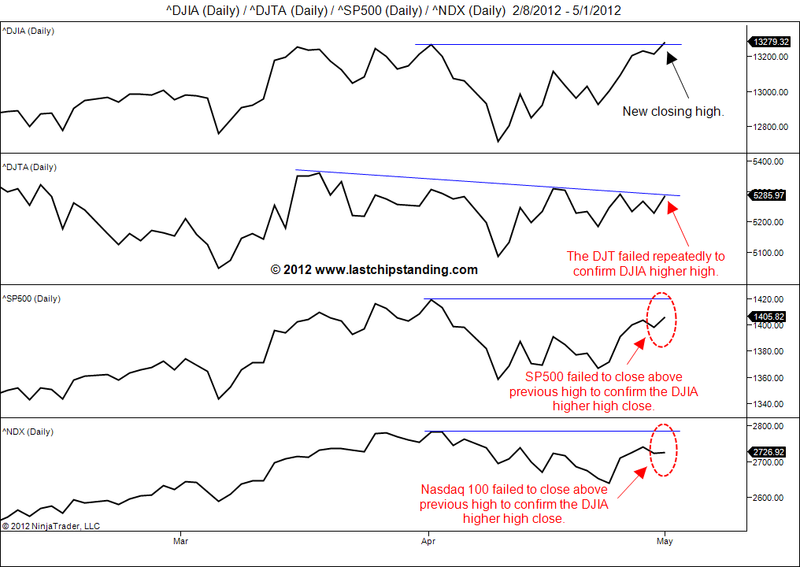 The following chart of the closing prices for the DJIA, DJTA, SP500, and the Nasdaq 100 shows the non-confirmation. Until the DJIA closing high is confirmed by other indices, I would rather be "out of the market and wishing I am in" instead of "trapped in the market wishing I am out". I have scaled out most of my longs before today's close. For now, I will move to the sideline and watch patiently.